Cabbage is one of the most widely available and inexpensive vegetables on the planet. It comes in many varieties and can be grown at different times in the season, which is key to popularity up here in New England, where the weather is so very unpredictable. 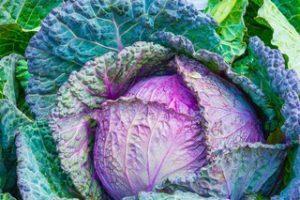 Not only is it beautiful to look at, but cabbage is very versatile to cook with; it can be eaten raw or cooked, stuffed, baked, sautéed, chopped up into coleslaw, or stirred into hearty soups and stews. It really is only limited by your imagination, as it works well with almost any other ingredient. Cabbage is also rich in Vitamins A and C, as well as calcium and potassium, and can last about a week in the refrigerator by itself. When you’re buying cabbage, you want to look for fresh, crisp-looking leaves, with heads that seem heavy for their size. A friend of mine recently told me she hates cabbage and can’t seem to find any good way to prepare it, so I thought I would also add a great recipe to either warm you up to cabbage with, or maybe shake up your normal cabbage-preparing routine. Enjoy! Combine the cabbage and apples in a large bowl. Add the vinegar and a pinch of salt. Toss well. Heat the butter and oil in a large saucepan. Add the onion and saute until tender but not browned, about 5 minutes. Add the cabbage and apples, stir well, and add the wine. Bring to a simmer, cover, and simmer gently under the cabbage is tender, about 40 minutes. Add a little water as needed to maintain a simmer. Season with salt and pepper to taste, serve hot.